Putting Parmidge JumpEZE on your Cruiser is about as easy as checking your battery level. In fact, I suggest you check your battery level while you are there just to save time and take advantage of the opportunity. 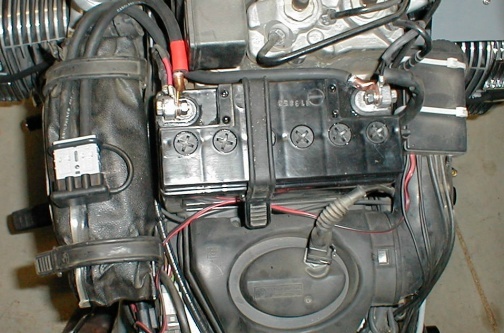 Once your tank is off (the hard part), fitting your JumpEZE to the battery is pretty straight forward. The photo below shows what you will see once the gas tank has been removed. 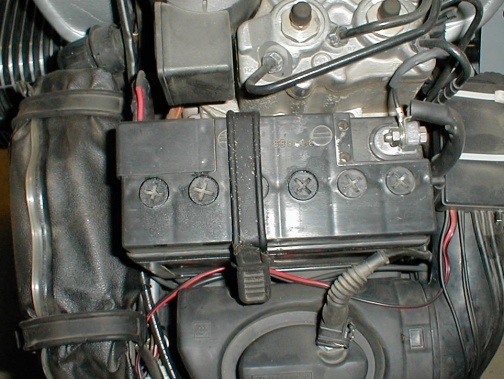 Note that the positive battery terminal is on the left (the one with the plastic cover) and the negative terminal is on the right. When working with the battery, always remove the negative battery cable first. This way if you touch ground (negative) while working with the positive side of the battery, sparking or wire damage won't be a problem. First off, undo the nut and bolt that hold on the negative wire and remove the bolt. Bend the negative or ground wire away from the battery so it has no contact with the battery terminal. Next, remove the plastic cover from over the positive battery terminal (it has a little plastic clip on the side then the cover is held onto the battery with two pins on the hinged end, just pull it straight up and it should pop right out). Undo and remove the nut and bolt that hold the positive wire to the positive battery terminal (keep track of any washers as they will need to be put back on). Lay out your Parmidge JumpEZE so the color coded terminals line up with the correct battery terminals (Red for positive and Black for negative). Bolt up the positive battery terminal and wires with the addition of the JumpEZE and snug it down. If you set it up like I have in the photo below, there should be no problems with reusing the positive battery terminal cover. If the positive battery terminal cover won't fit because of other accessories you may have, trim some plastic from the cover until it fits (don't leave the cover off). Touch the negative cable to the negative battery terminal. If there is a little tiny spark don't worry about it, it's only your bike's computer recognizing that power has been restored. If there is a HUGE spark, you need to go back and find out what is wrong before proceeding. Bolt up the negative terminal as it was with the addition of the negative wire from the Parmidge JumpEZE (it may be necessary to bend the terminal end of the JumpEZE to clear the ABS units so there is no pressure on the battery terminal) and snug it down. The finished assembly should look similar to the photo below. JumpEZE in place. Using this cable placement and routing, the positive terminal cover should fit with no modifications. Dangle the plug end of the Parmidge JumpEZE off the left side of your bike so it's out of the way. Switch on your ignition and test your electrical systems before refitting your gas tank (if for some reason the ignition doesn't come on, the problem needs to be rectified before proceeding). 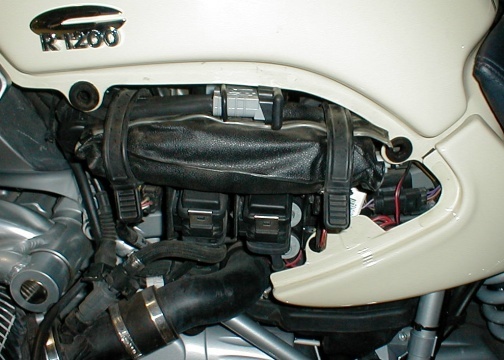 After refitting your gas tank and everything is ready, slip the JumpEZE cables under the tool kit holding strap and tuck the plug under the gas tank edge (the dust cover of the JumpEZE plug will hold it in place). See photo below. JumpEZE plug tucked in under the gas tank. Refit the side covers and seat and you're ready to roll!